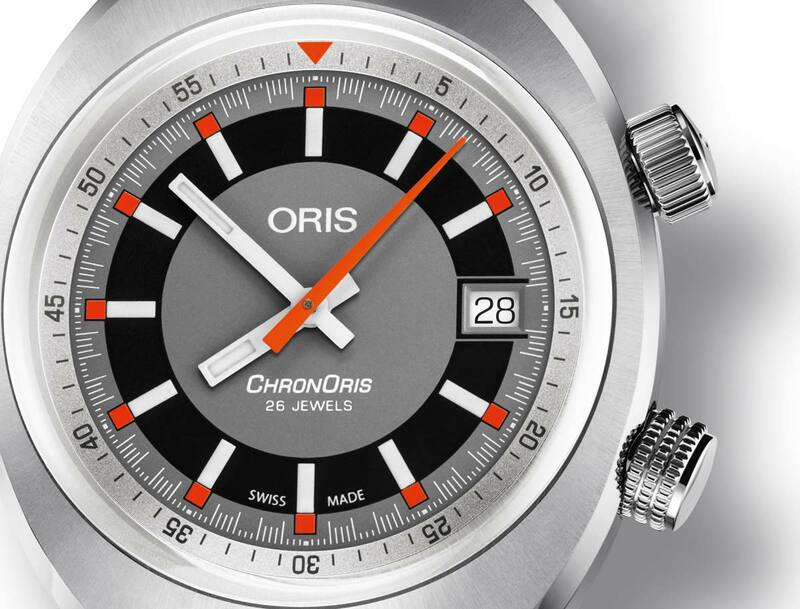 Introduced in 1970, the original Chronoris was the first stopseconds chronograph produced by Oris. It was also the first watch in the brand’s Motor Sport collection. The watch had an orange seconds track that ran three quarters around the dial and an orange central seconds hand that gave it a bold look. The 2017 Chronoris Date becomes the first new Chronoris since 2005, when Oris introduced a replica. For the 2017 model, the company’s designers and watchmakers have reinterpreted those early 1970s models to create a vintage-looking timepiece, although with a slightly different function compared to the original. 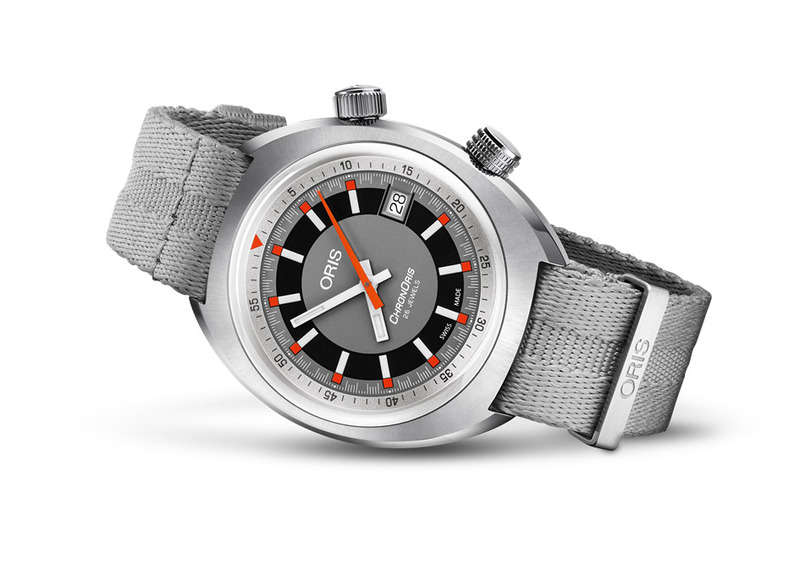 Water-resistant to 100 metres / 330 feet, the streamlined 39 mm case frames a multi-tone sporty dial with orange hour markers and central seconds hand. Indices, hour and minute hands are filled with Super-LumiNova. The timer function can be activated by rotating the inner bezel via a separate crown at 4 o’clock: it allows the wearer to time seconds, minutes or hours, depending on which hand the orange triangle is aligned to zero with. 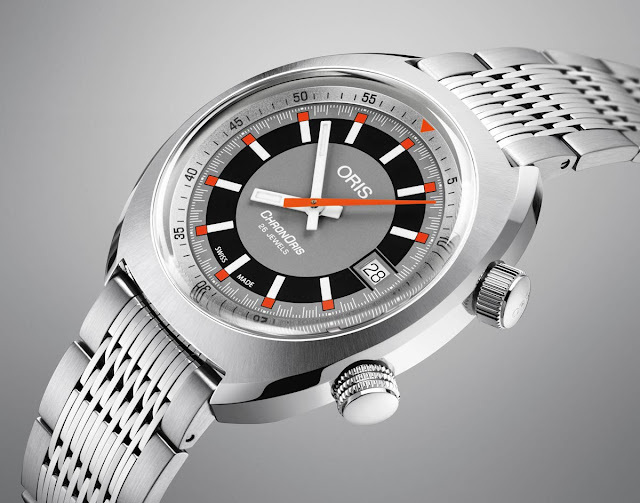 The new model is powered by the automatic movement Oris Calibre 733, based on Sellita SW 200-1, with date at 3 o’clock. 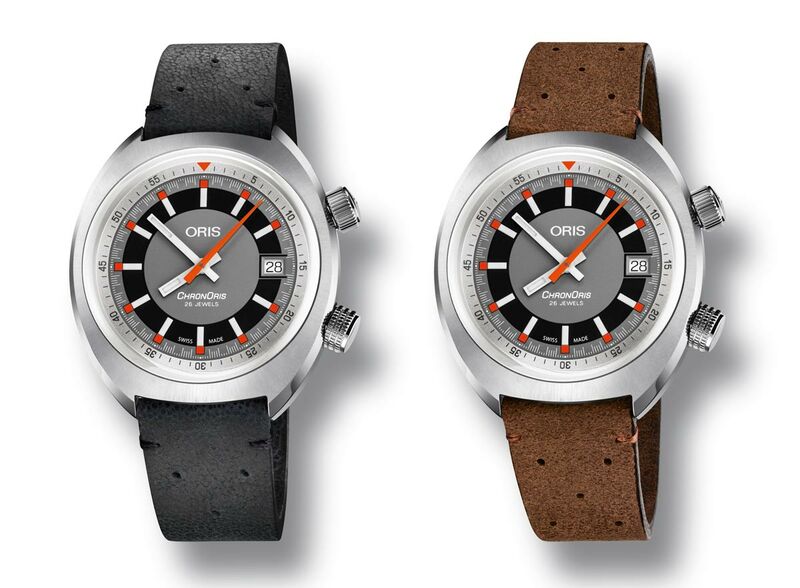 It comes with a wide range of strap options: brown or black leather, black rubber or grey NATO. An articulated stainless steel bracelet with 15 links is also available. Oris Chronoris Date. 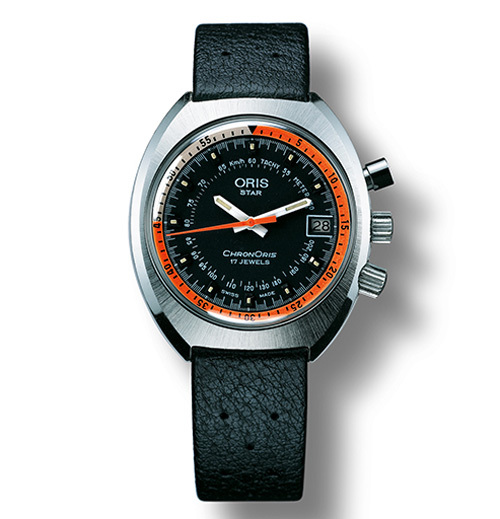 Introduced in 1970, the original Chronoris was the first stopseconds chronograph produced by Oris. 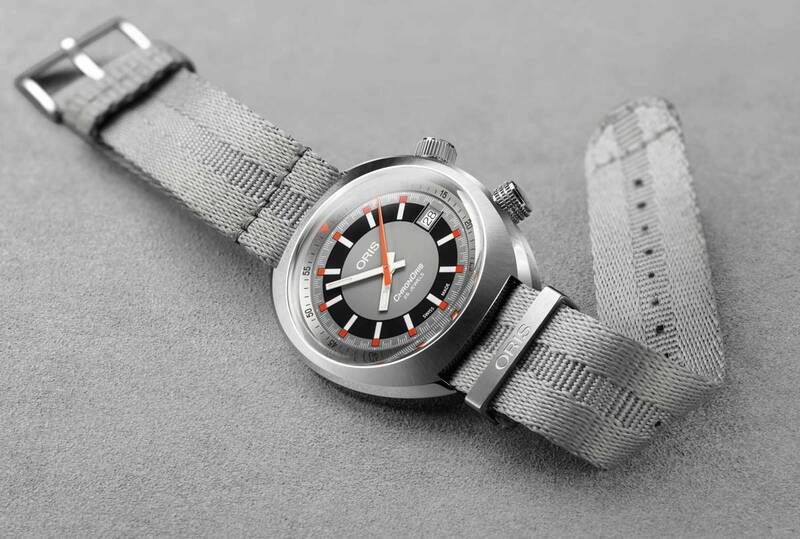 It was also the first watch in the brand’s Motor Sport collection. The 2017 Chronoris Date becomes the first new Chronoris since 2005, when Oris introduced a replica. 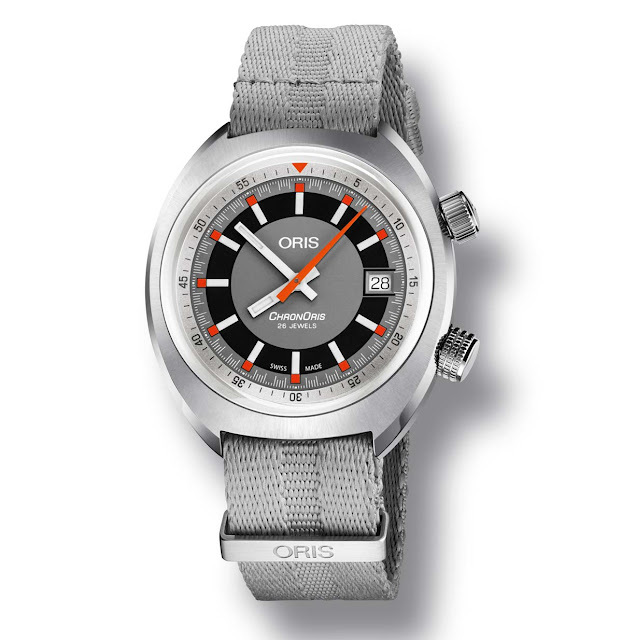 The retail price of the Oris Chronoris Date is Swiss Francs 1,600 on a strap or Swiss Francs 1,800 on metal bracelet. 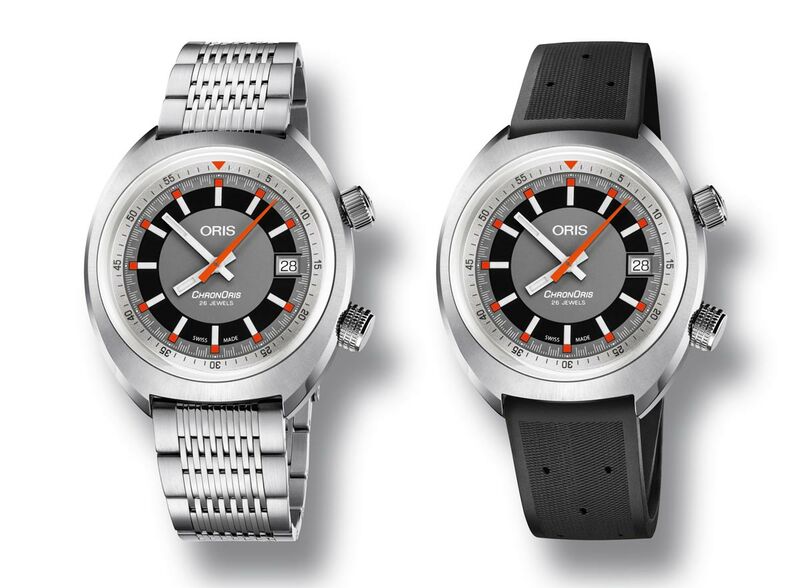 Oris novelties 2017. Oris Basel 2017. Baselworld 2017.